The fight against the Dakota Access Pipeline carries on as construction continues amid requests from the Obama Administration to halt the project. As hostilities grow between campers and police, the arrest count is rising to an alarming rate with more than 260 arrests in the past two months. On Indigenous People’s Day, Oct. 8th, 27 protesters were arrested for trespassing, reckless endangerment and engaging in a riot, despite that they were actually partaking in peaceful prayer. Among those arrested included actress and environmental activist, Shailene Woodley, who recorded the events in a live stream via Facebook and showed police fully-equipped with riot gear and military vehicles. Just this past weekend, another 127 protesters were arrested in a demonstration with 300 people at the construction site. The militarization of North Dakota police has built up to a massive display of force since Governor Jack Dalrymple declared a state of emergency in mid-August. Surveillance flights follow protesters, and police set up multiple roadblocks and checkpoints to prevent more from joining the Oceti Sakowin camp, by checking IDs and questioning drivers. Some protesters were attacked with police dogs and pepper spray last month. Energy Transfer hired G4S, a controversial private security organization known for servicing prisons. They have assisted officials in blocking roads and surveilling protesters. Police support in Morton County is expected to grow as stated in a press conference by Sheriff Kyle Kirchmeier earlier this month. Ironically, Kirchmeier is worried about “outside agitators” when an unnecessary amount of force is being brought in from out-of-state in opposition of a peaceful protest. Along with the militarization, the charges against the water protectors have risen to an extreme, with many individuals arrested for trespassing and inciting riots — despite Energy Transfer having no right to construct along Lake Oahe in the first place, as it violates federal and tribal laws meant to protect the land from being taken from the Standing Rock Sioux Tribe. 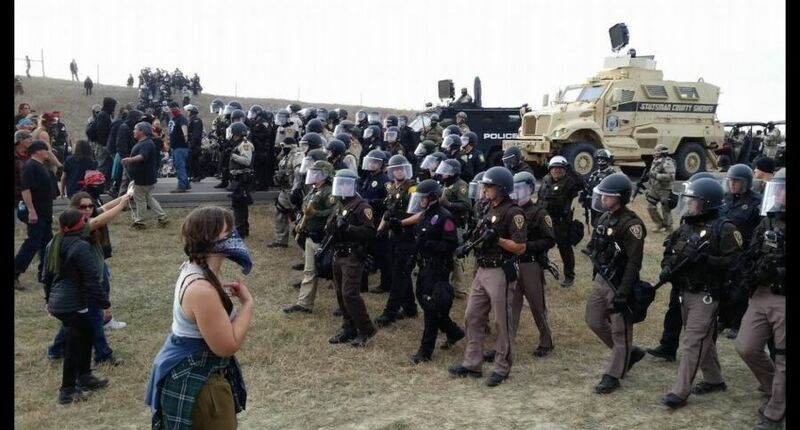 In a recent report by the Civil Liberties Defense Center (CLDC), a group of attorneys providing legal consultation for the water protectors stated that the police’s tactics have been found abusive and in violation of First and Fourth Amendment rights. The police have also alerted local farmers to “arm themselves” should anyone trespass their land, and officers have stopped wearing their name-plates and badge numbers — which is illegal for a North Dakota State Trooper to do. This is supposedly to prevent threats against their homes and families, but given the brutality that has occurred within the past few months — and that an officer’s personal information can be difficult to obtain — it’s really just an excuse to avoid the consequences to their actions. Among those arrested include tribal leaders like Standing Rock Sioux Chairman, Dave Archambault, who revealed in an interview with “Democracy Now!” that he was strip searched after he was charged on Aug. 15th for disorderly conduct, a misdemeanor offense. Charges were dropped against him Sept. 16 by a federal judge in Bismarck. “I thought it was humorous, because I had to take all my clothes off, and then they wanted to check my braid for—and I don’t have a very thick braid for any weapons to hide, but so I thought it was pretty crazy and unnecessary to do a strip search and to check my hair,” Archambault recounted in the interview. He also noted that of the five states the pipeline is set to run through, it is only North Dakota that is receiving extra police force from out of state. With the massive amount of arrests from this past weekend, Archambault is disappointed at the disregard of First Amendment rights from state and congressional politicians as well as Governor Dalrymple. “Their lack of leadership and commitment to creating a dialogue towards a peaceful solution reflects not only the unjust historical narrative against Native Americans, but a dangerous trend in law enforcement tactics across America,” said Archambault in a statement to North Dakota’s local NBC news. Freedom of press was recently put in jeopardy when “Democracy Now!” host Amy Goodman — who reported protesters being pepper sprayed and having dogs sicced on them on September 3rd — faced trespassing and riot charges five days afterwards. They were dropped this past week due to lacking evidence or motivation. Meanwhile journalists from Unicorn Riot continue to be arrested for their coverage of the movement. But a journalist’s job is to report on current events, especially when human rights abuses are involved, and there is absolutely no justification to use attack dogs on peaceful protesters. The protest against DAPL needs to be documented as it is still going strong, and there are still ongoing violations of federal law and First Amendment rights. The claims of riots and violence only try to discredit why the water protectors are there to begin with, and it disregards any wrongdoings done by Energy Transfer and police force within the past year. As indicated by Archambault, without any open dialogue toward compromise these problems will only get worse in a never-ending cycle of injustice. The land rightfully belongs to the Standing Rock Sioux, and Energy Transfer violated historical preservation, environmental protection, and tribal sovereignty in order to build a pipeline. Energy Transfer needs to stop grasping at straws to justify construction when they are the only ones breaking any laws.